Product #17212 | SKU PB-SXS | 0.0 (no ratings yet) Thanks for your rating! Designed to hold, organize and protect your memory cards. The Porta-Brace PB-SXS Memory Card Organizer is a durable, 1000-denier Cordura case that holds, organizes and protects your memory cards. It is designed with 9 view-through pockets to carry Panasonic P2, Sony SXS, CF, SDHC or other cards of comparable size. The case has touch fasteners positioned on its seams to help keep it closed. It has a simple design and folds to fit into your camera bag, backpack or handbag. 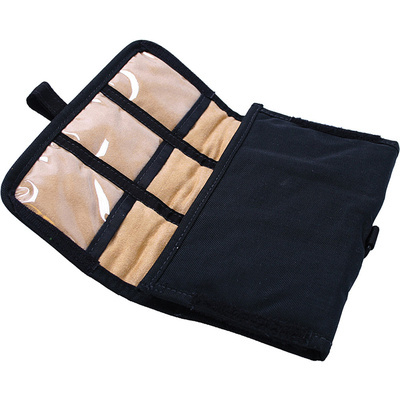 The organizer weighs only 1 lb (0.45 kg) and has a belt loop sewn in for easy carrying when you are shooting.